Firstly, you need to be an artist with the celebrity status of Japan’s Takashi Murakami. Secondly, you need to join forces with French luxury goods manufacturer, Louis Vuitton, whose hilariously expensive handbags and clutches adorn the pretzel-thin arms of the world’s most watched fashionistas and celebutards. Thirdly, you need to get yourself exposure – and preferably a retail outlet – in one of America’s biggest contemporary art galleries. OK. That’s the hard part. Now comes the easy bit. Whip up a design for Vuitton to print onto some fabric, out of which the company will craft some of aforementioned exclusive fripperies. Said process will leave quite a few remainders and off-cuts. Take those off-cuts, grab a few timber stretchers, attach off-cuts to stretchers, sign and number them on the reverse, then sell in shop set up in large contemporary art gallery. Easy. But where does this leave the people who snap up your ‘limited edition prints’, if they bought them thinking they were acquiring ‘original’ works of art? According to LA-based art collector and gourmet butter retailer (! ), Clint Arthur, this is what happened to him (that’s a visibly cranky Arthur pictured with his prints above). And he’s more than a little miffed. And, if as reported in the LA Times, up to $US 4 million worth of Murakami ‘prints’ were sold at a Louis Vuitton boutique that had been set up inside a retrospective at the Los Angeles Museum of Contemporary Art, there were many other collectors who were also happy to pony up the cash to buy these ‘artworks’. Now, Murakami, along with peers such as Jeff Koons and Damien Hirst, uses his practice to challenge the traditional boundaries between art and commerce. He has established a multimedia collaborative relationship with Vuitton, extending to the construction of a manga candyland cartoon clip featuring Vuiton’s ‘Superflat Monogram’ (really worth a look) in which Murakami acknowledges the ‘brilliant guidance’ of Vuitton’s artistic designer, Marc Jacobs. In this, Murakami et al are Andy Warhol’s cultural heirs. All of which is fine. But, art theory aside, the aggrieved Arthur is suing Louis Vuitton for fraud, alleging that the luxury goods manufacturer did not disclose that the ‘prints’ were contrived from bits left over from the manufacture of the Murakami-designed handbags and other natty be-tassled goodies also for sale in the boutique. 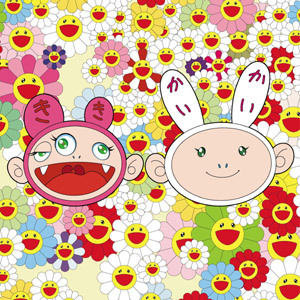 The prints were described in the boutique as “canvasses revisited by Takashi Murakami”. “Revisited”? Now that there is some of the best and most creative use of art sales lingo I’ve yet to see. Louis Vuitton argues that, as an experienced art collector, Arthur should have known what he was getting. Moot point. But the devil is in the detail. And where things may get sticky for the French company is with California’s ‘Fine Prints Act’. The purpose of the act is to ensure that buyers are given all the information they need about the nature of a print at the point of purchase. To avoid, I’d imagine, the sort of debacle that saw collectors fleeced out of millions of dollars by the ‘printmaking’ process set up around the elderly Salvador Dali. At their best, original prints are exquisite – I’m a nut for them. But for anyone other than an expert, the processes used to make prints can be pretty obscure. And the difference between an original, fine print and a mass-produced, ‘limited edition’ print… well, think a cubic zirconia and a diamond. Mr. Arthur believes he’s been landed with a couple of cubic zirconias. And where it might get difficult for Louis Vuitton is that the Fine Prints Act (1744(4)) makes it very clear that an art seller must tell a buyer when the “multiple or the image on or in the master” is “of an image produced in a different medium, for a purpose other than the creation of the multiple being described”. In short – if the fabric was made for the bags, and the prints were an afterthought, then there could be a problem. Then again, Vuitton might just say that the fabric was made with the express intention of producing prints, and the bags were the afterthought. Chickens and eggs. Point being – fine art prints? One very large, squirming can of very slippery worms.